Written by Janet Choi on May 26, 2016 . 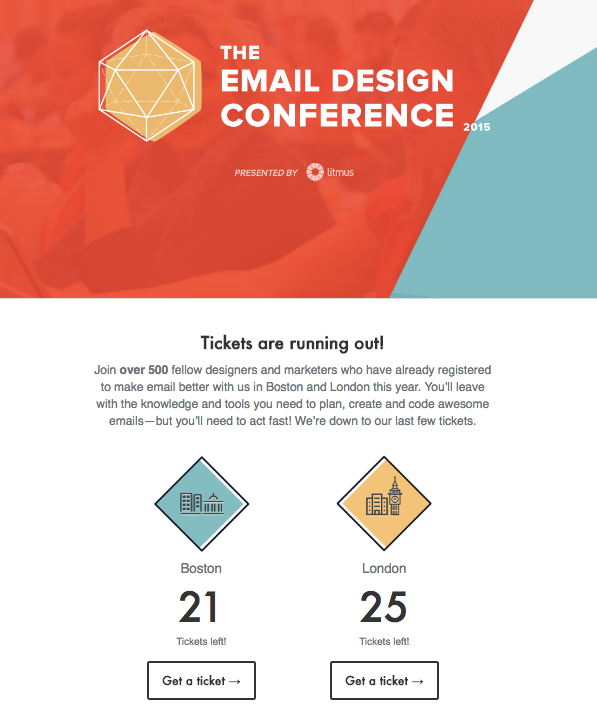 When it comes to putting together email campaigns, we’re usually laser-focused on trying to say the right things and design the right buttons to increase clicks. But in getting so caught up in the old-school email marketing metrics of success like click-throughs and open rates, we often forget what actually drives customer conversion: an excellent experience. 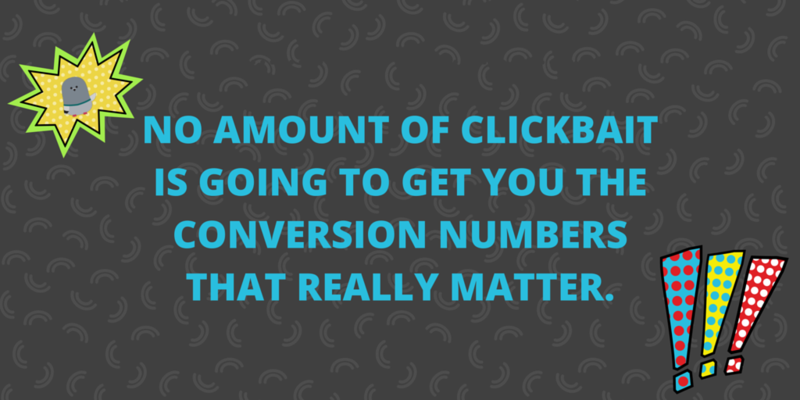 Unless your message contains relevant, interesting, and actionable information, no amount of clickbait is going to get you the conversion numbers that really matter to the business. To get to the root of the matter, we have to look at what compels people to take action. Social psychologist Howard Leventhal did just that in a classic experiment with Yale University seniors. In the experiment, Leventhal tested how effectively tetanus brochures could convince students to get vaccinated. The results provide interesting insight into what kind of copy motivates people to act. Each student received a brochure with two parts: (1) a description of a tetanus patient, his side effects, and how he battles the disease and (2) instructions for getting tetanus shots. The purpose was to test the two popular motivators: directions and fear. High-fear descriptions had graphic pictures and included vivid descriptions of tetanus patients (bleeding, convulsing, going into shock, and even dying). In order to make the subject feel vulnerable, the brochures also mentioned how tetanus-causing bacteria live everywhere — under your fingernails, in your mouth, etc. Low-fear descriptions plainly stated facts and side effects, with no details or pictures. Specific instructions in the brochure included a map, directions to the health clinic, and available vaccination times. The brochures also urged students to make time in their school schedule. Non-specific instructions simply informed students that free tetanus shots were available at the university health clinic, which they could schedule at their convenience. You’d think that skin deformations and convulsing bodies would get everyone to start lining up at the clinic for their tetanus shot — but the results showed that fear didn’t make the largest impact on behavior. Only 44% of people who went to get the shot were exposed to the high-fear brochures. What proved to be shockingly effective was the specificity of the instructions. 88% of the people who went to get shots had received the detailed plan for what to do next. So the natural question arose: do people even need fear to motivate them to act? In a followup experiment, Leventhal took fear out of the equation and provided students with brochures on how to get a tetanus shot. The results confirmed his suspicions: 0% of participants went to get the vaccinations. Turns out, while intensity of fear may not be as powerful as you think, you still need to tap into some existing appetite to nudge people into action. The information must not only instruct the audience but must create motivating forces which induce attitude and behavioral change. Step 1: Set up the situation with some urgency. click through to see full email 3. Meet an immediate need. Offer something useful at the right time. This is where using behavioral triggers and lifecycle-based segmentation to email people with relevant offers or next steps shines. 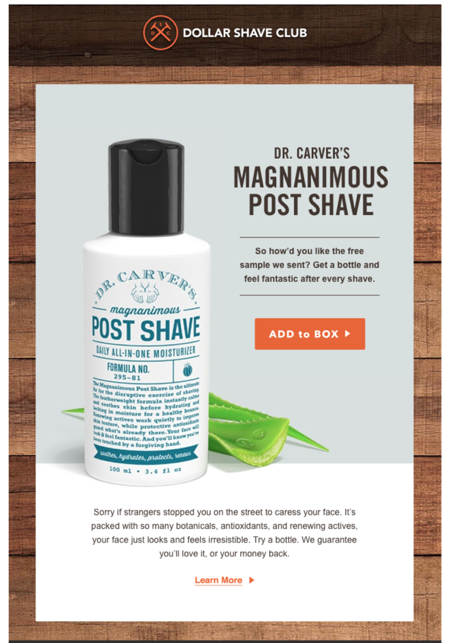 Here’s an example from Dollar Shave Club: They offer their post shave cream a few weeks after sending a free sample. If you’re getting this email, your motivation to buy is higher because the offer is most relevant right then. Step 2: Provide specific direction. Long ago, social psychologist Kurt Riezler found a correlation between aversion and ignorance, or what he called “fear of the unknown.” He observed that people tend to naturally avoid what they don’t have enough information on. This explains why, in Leventhal’s study, specificity was crucial to the formula of getting students to act. You might successfully build urgency and tap into a drive to act — but if you don’t offer any guidance on how to act and what to do next, people will falter. So as you create motivating factors in your message, make sure to include next steps that are as specific as possible. Avoid overwhelming users with too much information that overloads decision-making capabilities and gets in the way of action. Let’s take a look at 3 places where you can insert specificity: 1. In the subject line. What’s going to stand out against the firehose of noisy sales announcements and promotionals? A succinct headline that indicates a message that’s super relevant to the reader. That’s why for many emails, it’s better to be specific with the subject line rather than try to provoke curiosity. Skillshare fits their whole offer in the subject line here but that’s everything somebody who’d be interested in this deal to open and click through. Better that than have eyes fly by because of a generic “we’re having a sale” subject. Here’s another subject line from the onboarding tool Appcues. Not only did they get the timing and audience right — I hadn’t yet integrated after signing up — the contents of the message are clear. Consider trying or testing this type of direct approach for an activation message rather than the plain “How are you doing?” or “need help?”-type line. In our last subject line example, Joanna Wiebe aims straight for the goals of her target audience with a conversational question. It’s specific and attention-grabbing in a way that even concrete commands for people to “Register for [insert training or webinar title here]” aren’t. 2. In the CTA. Personalized CTAs — that is, CTAs that are customized to the user — can increase conversion by 42%. After doing a great job grabbing attention with your subject line and nurturing that attention with motivating and informational copy — don’t tack on a generic button that says “learn more.” Here’s an example snippet from one of our own emails. For new users who tell us they’ve heard about us from the data hub Segment — we customize the main call-to-action in our welcome email to talk specifically about a Segment integration and provide a link straight to the relevant docs. 3. In onboarding instructions. Many companies send a link to an FAQ or documentation section — or include a dizzying array of possible next steps in one message, which is overwhelming. Break up the steps and then send them in multiple emails with one goal per message. 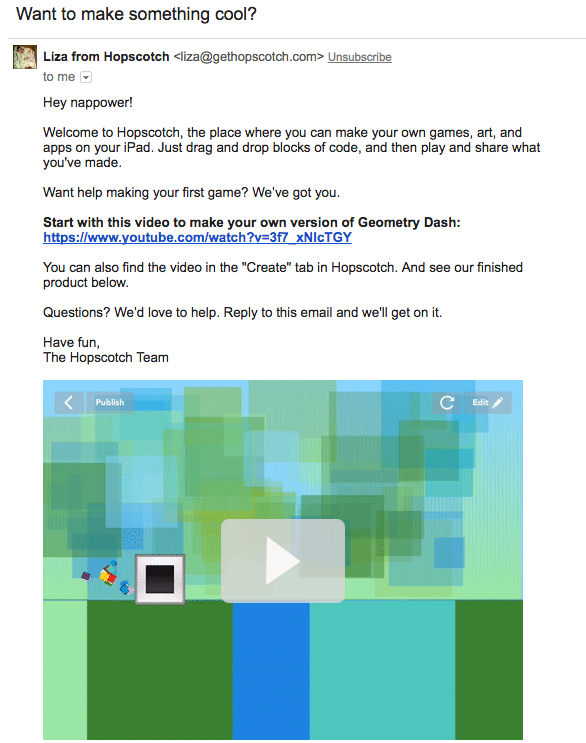 Here’s an onboarding email from Hopscotch, which teaches kids how to code and create fun games and art. Notice how the email gives you one place to start — one specific game for you to learn how to create. And there’s one call-to-action: to check out the video explainer. 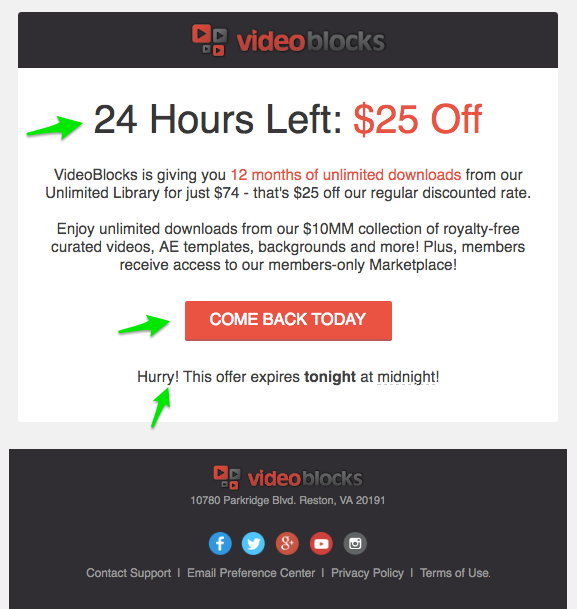 When marketers pack their emails with information and don’t connect their message clearly to motivation, they’re relying on users and readers to take it from there. But most people’s inboxes are so cluttered that only immediately relevant and engaging content has a chance at winning attention and inducing behavioral change. Use motivation and specific instructions to guide your customers through to actual action. Whether people engage with your brand or not are decision points. It’s up to you to make those decisions easier by providing what’s essentially an excellent user experience. Have you seen or used examples of the golden formula for action? Share with us in the comments!